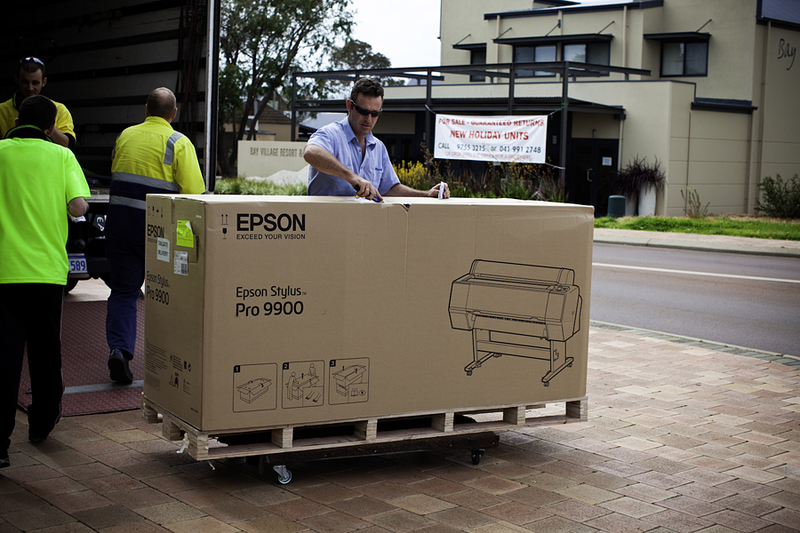 Well it arrived last week, my new Epson 9900. It was delivered by 4 burly blokes and they were kind enough to carry it upstairs for me. The following day Benny from Team Digital came down to help me get it running. He made some icc profiles for me and we tweaked the settings to get the best out of the machine. I must say it is bloody good, in fact it is bloody sensational. The other week I did a workshop with Les Walkling and he was raving about this machine. He showed us the colour gamut compared to the Canon and it is able to reproduce so many more colours than the ipf range. Still the old Canon has done me well but out with the old in with the new. Will do a proper review of the machine once we get it in the dedicated printing room and start using it properly. I want to thank Epson in conjunction with Team Digital for helping me get into this machine. It has been fantastic to have the support of two great companies and I intend to wear the Epson badge with pride. Thanks again guys. ~ by christianfletcher on October 22, 2009. Is that mother using the new HDR inks or whatever they are ? Hey Paulie, good to hear from you mate, Yeah I’m back to Epson after leaving on a voyage of discovery to foreign shores. Got lost on a deserted island but praise the lord I have been welcomed back into the brotherhood of Epson users. Mate I hear you have a 4.5 meter print of a CF photograph, can anyone get to see it?? I will send people your way for the big big stuff. I’ll tell em your the guy with the biggest instrument in Perth, if not the whole of Australia. Size does matter and you are packing some serious muscle mate, the girls are going to love it! Not to mention all those geeky photo nerds! i remember you raving on about canon printers being the best!! Bloody hell Epson!!! I thought I provided my delivery address very clearly yet somehow you managed to deliver my printer to CF Photo Images??? Sorry for the inconvenience CF, I will arrange for Epson to pick-up the printer ASAP and re-deliver to the correct address. sure Neal as long as I can claim them as my own!! Stakky they were three years ago, no doubt they will have a new one out soon that will blow us away. Canon seem to do that. Ric, I thought that name on the box looked like Ric not Chris. Sorry mate you can come and get it. Bring 4 guys and a truck and it is yours!! Yeah Matty it was great of Epson to see some value in helping me out. I’m alway looking at the best gear around, if Nikon hits the lead, I will follow. Still those guys at Canon keep bringing out great gear. I printed a 100″ canvas shot with the 17mm. three images stitched using the shift and it worked pretty bloody good, very sharp with only slight softness near the edges. Love that lens. Last week I got myself an Epson 4880 which runs the same Vivid Magenta K3 Inkset as your behemoth (I believe). I have just been blown away by the print quality. Wow Christian! That thing looks like a beast, will have to investigate the smaller versions for myself sometime, might have to check the car for loose change. By the way, I’m heading down south for a photo trip mid-november, will try and pop into the gallery while we’re in Busselton. printed, framed and with your magical touch, what else can a hack wish for ! Wow there is some spooky symmetry going on here. I’ve also just received my new Epson (direct from Epson themselves, from their factory seconds online store) but it’s a Stylus Photo TX800FW and it was delivered by a petite Australia Post lady who lobbed it on the counter at work. Felt pretty happy with it until I read this, but I bet it will print out a 6×4 pretty damn quick! And we Yanks thought we did things big! Glad the blokes heaved the beast up the stairs, it gives me a hernia just looking at it. One beaut little(?) printer there Fletch. I seen one before and the prints were crackin’. I would like to know how it handles the Illford High Gloss, will it look even more like Fujiflex, will it be the last nail in poor Cibachrome’s coffin? So from your words there CF, I gather they gave it to you! You can pull your pants up now. lol, Now that’ a Printer!! nice one. Yeah come and see me Levi, am at the dunsborough gallery most days. Now Adrien when am I going to get time to print your stuff??? I have a hard enough time doing my own!! Fitzies do the best job in town, besides, I’d be way too expensive!! hehe..
Muzz you crack me up, any pics of this beast?? It did me too Steve, now we have to try and make it fit in our office. Matt the hi gloss media will sing on this baby. Cibachrome, is there such a thing anymore?? Tommy, Tommy, hardly got it for free but did get a better deal than Les Walkling, so he tells me. As Les is a bloody legend I am pretty happy with that! Sorry Les. Will, it is a real crocodile dundee moment, still it isn’t the biggest but I’m happy with my manhood!! Steve, it does the same to me! Hehe CF I will bring it to the pizza night and you can drool over it there 😉 Funny how they had to send 4 burly blokes down there – didn’t they think they could find any in Dunsborough?? So seriously, have you picked which print you want to do first? You could just about do a lifesize photo of the kids! I wonder how much different one off your old printer would look next to one off this one? Gotta get that new rip mate! I take it you are now moving away form HP? and I was just going to buy one. Ok not a big one like you boys. Im looking for a A3 or A2 printer. whats the best way to go? Rip is out now I think Markie, and welcome home! Hi Nige, good to hear from you. Yep I am Epson all the way now mate. I had Canons not HP anyway. I still have the small Canon but will be replacing that pretty soon. I have been looking at the new Canon iPF5100 A2 printer with roll feed, and it has 12 ink sets. what do you think about this model? while I will be usingit mainly for my weddings and portraits I would like to be able to print a nice pano when I get one, mind you if you look at my new blog http://Blog.amifocus.com you will se the landscapes I have been doing. there are one of two boudoir shots there that would make a nice landscape. love your images cant wait to grow up like you one day.